Sheffield United defender Kieron Freeman could emerge as a target for Championship side Ipswich Town as he nears the exit door at Bramall Lane. Freeman, the 24-year-old defender, is also wanted by Portsmouth after a loan spell at Fratton Park last season. Freeman, the former Derby County defender, made only seven appearances for Pompey as they reached the League Two Play-Offs, losing to Plymouth in the semi-finals. And the defender was one of seven players placed on the transfer list by new boss Chris Wilder, shortly after the former Northampton Town boss replaced Nigel Adkins at Bramall Lane. Freeman was sent off against Wilder’s Northampton near the end of the season, but Pompey boss Paul Cook has made the defender one of his top transfer targets - although United may be forced to reach a financial settlement with Freeman if he does move to the south coast. Meanwhile, Wilder will face questions from United supporters when he and assistant Alan Knill attend two meet-the-fans events next month. The first will take face on June 23 at Holme Lea in Handsworth, and the second a week later at Farm Road Sports and Social Club. 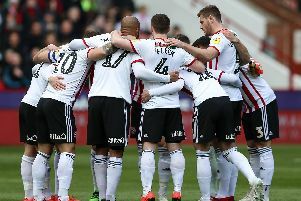 Both events start at 7.30pm and supporter liaison officer John Garrett said: “This will be a fantastic opportunity to welcome them both in true Sheffield United fashion to the family and throw questions from the floor about the plans they have laid for the eagerly awaited new season. Supporters can apply for tickets via United’s official website, with only a limited number available. “When the questions have finished there will be a chance to chat with them informally as we start to re-connect with our fan base,” Garrett added.